Gravity 1-Applies to Tie beams at wall openings. Gravity 2- Applies to Tie beams with walls bellow. 2) Structural steel shall conform to ASTM A36, yield strength 36000 psi. All bolt holes are 11/16″ diameter. Bolt diameter is 5/8″. 4) All Power Fasteners wedge bolt anchors shall be per manufacturer’s publishd information. Minimum anchor diameter is 5/8″ and anchor embedment shall be 5″. 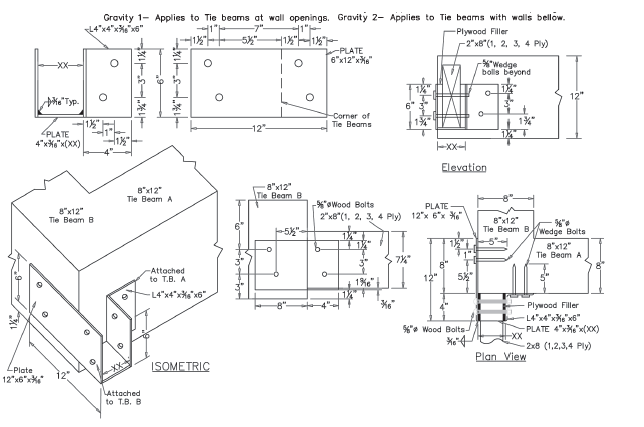 7) Bolts thru wood shall conform to section 11.1.2 of NDS 2005 and table 11G for shear values. 8) This connector shall only be used for wood members loaded perpendicular to grain. 10) Provide plywood shims to close the gap between carried members and steel connectors to prevent bending of bolts.